Have you seen the coverage of our project in The Dom Post (16th May 2016)? Next time you see your midwife ask her for a postcard campaigning for this or email choice@birthhub.org if you are a midwife and would like some for your clients. 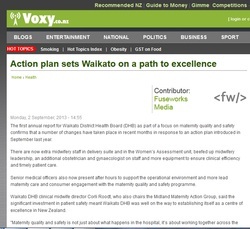 We would love the Capital & Coast District Health Board (CCDHB) or the Hutt DHB to embrace the action plan of the Waikato DHB who have, as part of a focus on maternity quality and safety, introduced changes such as extra midwifery staff and beefed up midwifery leadership. "Encouraging the option of primary birthing is important to the DHB and it is worth reflecting that the good outcome Waikato demonstrates against the national clinical indicators of normal births and low caesarean section rates are a result of low risk women being able to birth in environments suited to their needs within their own communities." Article that appeared last year before we held the "Freedom For Birth" screening in Wellington. 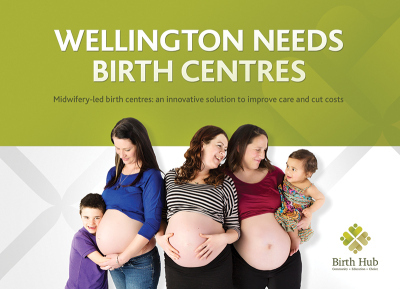 We are looking for specialists in PR/Media work to help us with this project so that we can promote our ideas for the Birth Centre amongst the Wellington community. If you are supportive of this project and can help us in anyway with our press releases, talking to the media and general PR tasks, please get in touch. This is an article dated February 2012 from Canada. 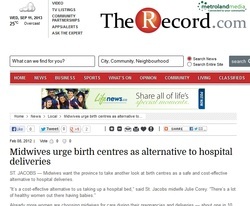 Midwives around the world agree that Birth Centres are needed as an alternative to hospitals. The campaign of the Ontario Midwives has greatly inspired our group. Take a look at their website.